Parody/original/polka ratio: 4/8/1...a record for original works on an ALbum! Production Summary: All thirteen songs were newly written and recorded for this album. In fact, "Attack of the Radioactive Hamsters from a Planet near Mars," "Isle Thing," "The Hot Rocks Polka," "She Drives Like Crazy," "Generic Blues," "Spam," and "The Biggest Ball of Twine in Minnesota" were specifically written just for this album without any connection to the UHF movie in order to make it a full-length release. Dr. Demento Status: Nine of the album's thirteen songs have aired on the syndicated Dr. Demento Show, with the last song to premiere on the show being "Attack of the Radioactive Hamsters from a Planet near Mars" on March 20, 2005. By the time The Dr. Demento Show ended its run on terrestrial radio on June 5, 2010, "Gandhi II," the album version of "UHF," "Let Me Be Your Hog," and "Fun Zone" remained the four songs from the album never played on the program. ("UHF" would eventually debut on the online version of the show on January 28, 2012, while "Gandhi II" would premiere on June 9, 2018--and "Fun Zone" would often be utilized as background music during syndication promos for the series.) Interestingly, "Spatula City" had only aired once on the show, on July 29, 1990. Tour Status: As of this update, 50% of this album has been included in a regular tour setlist. The first domestic Al release to feature an instrumental song. The last domestic ALbum on vinyl. Ties with Dare To Be Stupid, Polka Party!, and Alapalooza as having the fewest number of parodies of any ALbum, four. For reasons unknown, this was the last CBS ALbum to be re-released by BMG, reissued only weeks before Off The Deep End's release (and reissued the same day as the Transformers: The Movie soundtrack). It could be speculated that Scotti Bros. didn't feel that there was any reason to reissue a soundtrack to a movie that did less than expected at the box office...or that the label considered UHF to be more of a soundtrack than a Weird Al studio album and decided to reissue it with its other soundtracks. For a while, this was the hardest of Al's albums to find in stores. Debuted at #146 in Billboard (its peak position). It would stay on the "Billboard 200" chart for only four weeks. Released in Japan on October 21, 1989. 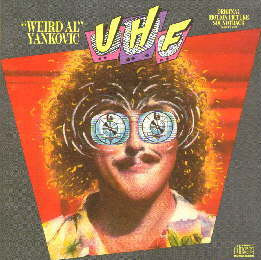 ALbum title/song connection: Big surprise here, but the title track and lead-off single is "UHF," and of course the album is promoting the movie UHF. Despite the fact that it is called a "soundtrack," this album does not feature any of the music that was scored for the movie by John DuPrez and Stephen Jay. The first ALbum with an original song as its lead-off single. UHF/Original Motion Picture Soundtrack And Other Stuff ©1989 Scotti Bros. Records. ©1999 Way Moby/Volcano Entertainment III.